Difficult paper, out-of-syllabus questions in exam, not enough preparation time between two papers – these are some expected stories that we get to see or read about during CBSE exams. It was through TV or newspapers that students would, earlier, convey their anguish or excitement with the board. 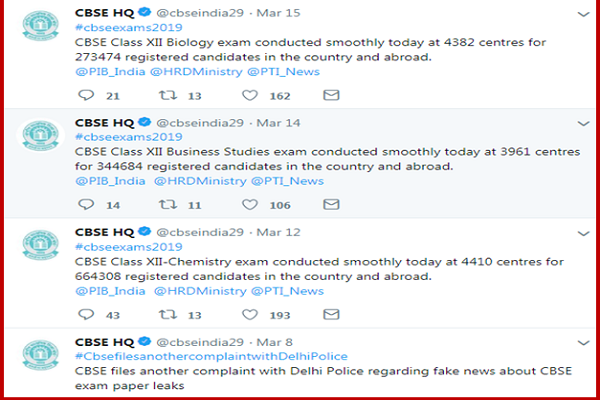 But with CBSE now accessible on Twitter, students have found a direct way of communicating with CBSE – letting it know what and how they feel about exams and their expectations from the board. Ab ki baar #cbse ne bilkul shi kha ki paper smoothly huva. Nhi to orr exams me #cbse ko roughly likna chaahiye thaa…. 10:30 to 1:30 : do you know the temperature at Odisha ?It is 37 degrees at 12 noon.Kindly consider to start the exam in around 9am. I want free marks. you up? U are making sports period compulsory and on the otherhand giving physics paper so tough . What it shows ? Paper leak hone ka koi seen hai? Maths ke liye bahut zarurat hai. Well, before you forget. Let’s remind you, class X boards are also on. So here, they go? Cbse plz treat science paper of class 10 as you treated class 12 chemistry.